Born in the Adirondacks of New York, Eric fished many famous trout waters as a youngster and was greatly influenced by local legend Fran Betters. Once a professional musician, Eric now is an electronics technician in the hospital communications arena and freelances when it doesn't interfere with his fishing and tying. The source of the Salmon River, as far as I know, starts in a big pond located in Macomb Reservation, above Schuyler Falls, New York. Now I’m not talking about the great big Salmon River that everyone knows about that’s located in the Western part of New York state, the one where fisherman go after huge steelhead. I’m talking about the little tiny Salmon River, located not too far from my hometown of Plattsburgh, N.Y., where fishermen go after diminutive stocked Browns. Anyway, the Salmon River starts at Macomb Reservation, plunges two miles or so down a hill, roars into the town of Schuyler Falls, under the main street, goes down a series of 6" deep rapids, meanders slowly through flat farmland all the way to the town of Salmon River (near the Tasty Freeze), from where it then barely moves through a fever swamp, finally petering out at Lake Champlain, by the Royal Savage restaurant. I know about the fever swamp because I fished the entire five miles of it one day with my friend Bruce Copeland, and am still trying to shake the Malaria. That is, however, another story. Like most kids in our area, I had done some fishing on Lake Champlain when I was younger. This typically involved going out in a rowboat at about 6 a.m., in the freezing cold, and fishing for perch with worms. I didn’t like getting up early, I didn’t like the cold, I didn’t like worms, and I didn’t like sitting around in a boat. It was boring. Later though, I discovered stream fishing. This I liked. You could move around. There was freedom, freedom from parental oppression, freedom to explore, freedom to do what you felt like doing, when you felt like doing it. You didn't have to get up at 6. You could roam, almost aimlessly. I liked aimlessly. The fishing was more technical. We had spinning rods, and they were much cooler than the bait casting rods of lake fishing. You could buy esoteric lures, you didn’t have to fish with worms if you didn’t want to. The lures were three in number. The Daredevil spinner (a red and white barber pole spiraled spoon), the Mepps spinner (all the way from Norway), and a plain spinner (the least expensive). If there were any other lures out there for Trout, we were blissfully unaware of them. I never actually caught a Trout on a spinner, but I spent days trying. I could get one on a worm every once in awhile, but I wasn’t too wild about worms. I needed something else. Then I heard about fly-fishing. I had seen a man fly-fishing once in Cape Cod. I knew there were wet flies and dry flies. That’s all I needed to know. I bought two flies at Montgomery Wards, a Royal Coachman and a Quill Gordon, a wet fly and a dry fly, the prettiest fly and the fly with the coolest name. I was ready. This particular day was probably in June. I was about 14 or 15 years old, and it was the very early Sixties. Two friends and I had been fishing the slow moving, meandering part of the Salmon River that wandered through North Country farm meadows. It was just warm enough that you felt like running around, aimlessly, and we did a bit. But our aim this day was to fish the bridge, and ultimately we wound up there. One of us had actually caught a fish off this bridge once (not me), and so we considered it a prime spot. The bridge was an old iron two-lane affair that crossed the river and served no useful purpose that we could discern. It was off the main road, on a side fork, and connected to nothing in particular. The fact that this was a bridge to nowhere didn’t concern us a whole lot this particular day, because from the vantage point of the bridge we could see trout milling around down below. We got excited. We were pumped. These trout were ours! The excitement wore off some in the next hour or so however, when we hadn’t gotten so much as a nibble. We were literally bouncing worms off these trout's heads to no avail. The sun was directly overhead, it was a clear, beautiful Spring day, and conditions for catching trout off a bridge couldn’t have been much worse. The good news was, we didn’t have a clue that conditions were bad. All we knew was the fish weren’t biting right now. Nobody was there to tell us that we couldn’t catch fish, so we assumed we could. I decided to fly-fish. After all, I had two flies. Someone had told me that to fish a dry fly you drifted it, on the surface of the water, over a trout’s head. So I tied my Quill Gordon, about a size 14 I would guess now, to the end of the 10-pound test line on my spinning reel. I carefully lowered it down off the bridge, and put it in the water just upstream of a fish. I have learned recently that this technique is called "dapping", but as far as I was concerned, I was fly-fishing. Little did I know that to fly-fish you need an $800 rod, a vest, waders, felt-soled boots, floatant, leaders, a $400 reel, and a guide. At least now you do. When you’re 14 you don’t. I can still see clearly in my mind the fly drifting down, right over the trout, and the trout coming up lazily and taking it, almost effortlessly, in slow motion. I suffered immediate cardiac arrest. My heart rate jumped to ten times normal, and I started screaming, "I got one! I got one!" With a mighty heave I set the hook, jerking the fish clean out of the water, slamming him against the side of the bridge which resounded with a mighty KAWANGGGG! The fish was killed instantly by the blow, and I was now furiously pulling him up, hand over hand, my spinning rod in a heap behind me. All the way up I kept thinking "he’s going to get off, he’s going to get off", but the old iron bridge had done its work, and his struggles were over. I pulled his cold, lifeless body over the top rail of the bridge and pounced on my prize. A ten-inch beauty, and caught on a fly! I was now at the pinnacle of fishing, fly-fishing, there were no more worlds to conquer, and I was hooked for life. The bridge that connected nothing to nowhere, had brought me to my destiny. Hook: Size 12 to 18, standard dry fly (Mustad 94940 pictured here). Thread: Black 8/0 to 12/0. 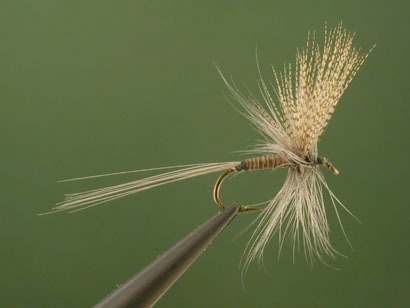 Tail: Medium blue dun hackle or Dun Coq de Leon (used in this example). Hackle: Medium blue dun rooster saddle or neck hackle.